We currently have two active local groups, in London and in Oxford. These meet regularly to work on joint and on individual projects. 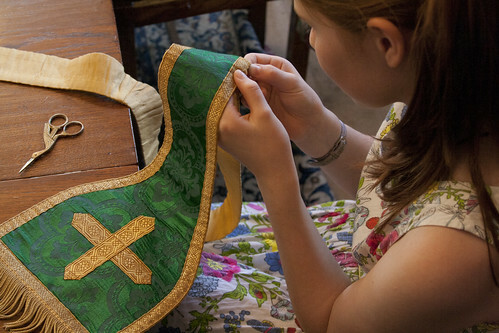 As well as working on the same projects tackled by the London Vestment Mending Days and the Sewing Retreats, the Oxford group has completed a number of projects for the Church of SS Gregory & Augustine in Oxford; the London group has done work for St Bede's, Clapham Park. One of the first projects of the Guild's Oxford group was the processional banner used by the Latin Mass Society. 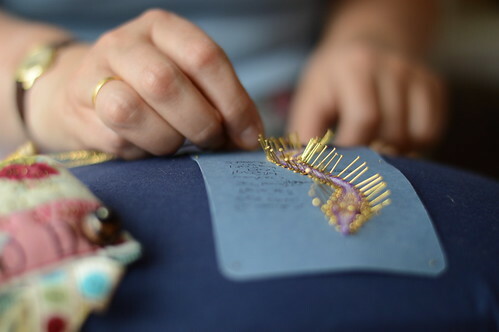 The Oxford group also has a special interest in lace-making. Contact lucyashaw@gmail.com to to be put in touch with either group.